Let your toddler have a great time by herself or with friends on the Crocodile Rocker! A bright, reptilian green, this rocker is made from top grade materials that won't fade or deteriorate. 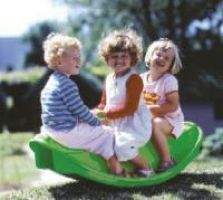 Durable enough to be used inside or outside, and specially designed for safety and stability, so everyone has fun. Can hold up to 3 kids at once, up to 150 pounds!